This is a monument to commemorate a brave little dog named Leo. Leo died while saving a 10-year-old girl who was being attacked by a much larger dog. Leo witnessed the little girl being pinned to the ground by the dog who began biting her. Leo immediately ran to the rescue and began biting the bigger dog on the leg who turned on Leo and let the little girl go free. "I screamed and Leo rushed out barked and ran around, biting him on the leg," said Nikolina Vucetic, the girl Leo defended. "When the dog let go of me, he looked around and then stormed at Leo." Sadly, Leo didn't make it. Despite efforts by veterinarians, his injuries were too severe and Leo died two days later. 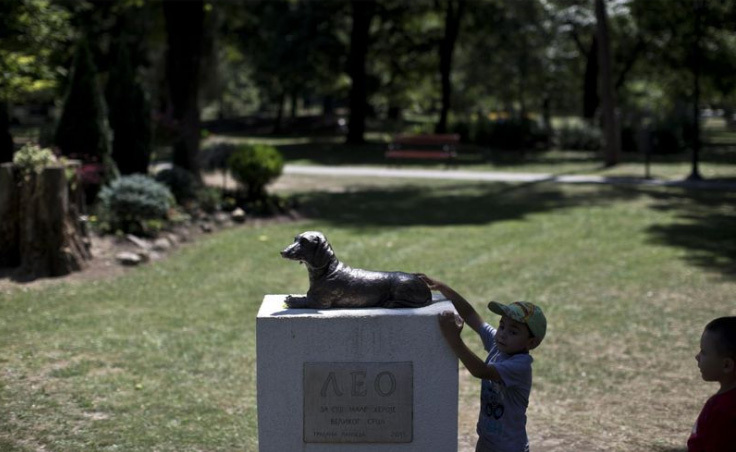 The statue is located in a park in Serbia so he can watch over all the children playing. The quote on the statue reads, "To all small heroes with big hearts", which is a true testament to the courage of little Leo.